Terry, loaded with a box of color coordinated scraps I pre-selected, made endless 6 1/2 inch log jam blocks (120+) and put a dent in my scraps (a small dent but any dent is appreciated!). 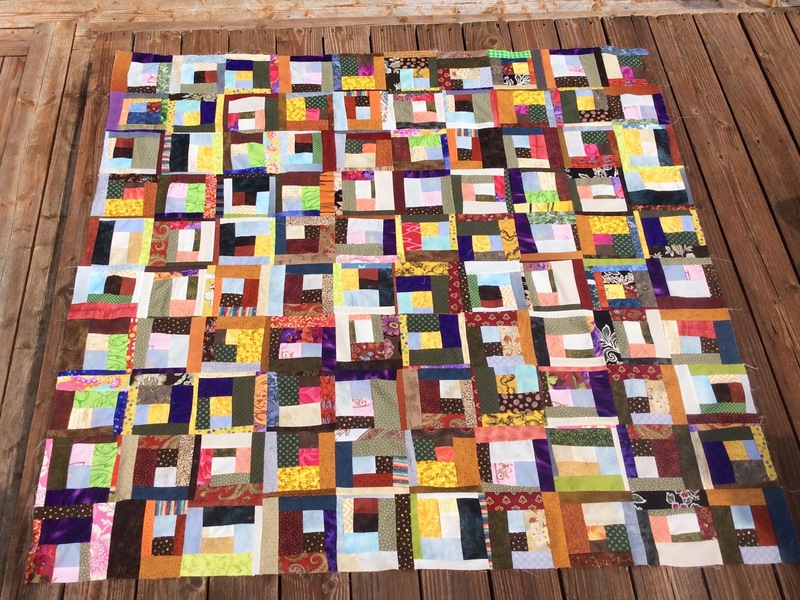 Then he took a 100 of the 6 1/2 inch block and created a 10 x 10 quilt. It was a collaborative process as he completed ten – 10 block rows, and I did the final sewing of the ten rows together to make the quilt top. Terry, The Quilting Husband, is not much for matching seams to sew rows together, but that is okay – look at how much he accomplished! Now I am working on putting the back of the quilt together so it can go to the long-arm quilter! Colorful Jam by tierneycreates and terrycreates! Next postGrab A Cup of Tea and Your Cozy Spot! Quite a challenge to put all those different fabrics/sizes together and make them look like they belong. You made them play well together.